dog, BJ, into the car, hooked up the caravan, and set off bright and early in the morning. Most of the way we travelled on freeways and highways so we made good time to Helensburgh where we left the Southern Freeway at Lawrence Hargrave Drive and travelled through Stanwell Tops to Stanwell Park. 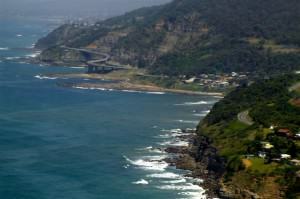 Thrill seekers flock to Stanwell Park; it is the primary base of hang gliding in New South Wales. The Sydney Hang Gliding Centre and Hang-gliding Oz conduct instructional tandem flights from Bald Hill and we stopped for a while to watch; it’s quite a spectacle. Did I want to have a go? Not in this lifetime! Although John said he might like to try it sometime. between Coalcliff and Clifton, north of Wollongong, hugged the coast and for over 100 years and was subject to rockfalls and embankment failures. The 665 metre long Sea Cliff Bridge is a brilliant and practical solution to the problem. The road now goes out over the water, avoiding the rockface. We left Bald Hill and drove down and across the bridge. There is a small parking area on the other side and we decided to stop there and walk back along the bridge. What fantastic views and what a spectacular engineering feat! Continuing on our way we passed through the coastal towns of Scarborough, Wombarra, Coledale, and Austinmer, Bulli, and Woonona before rejoining the Southern Freeway for a short distance. We bypassed Shellharbour City and made straight for Shellharbour Village, arriving at the Shellharbour Beachside Tourist Park ([star][star][star][star_half]) a little before 2:00 in the afternoon. Our site was perfect; lots of grass, only a minute from the amenities, and as close to the water as we could get without getting our feet wet! There are quite a few Norfolk Pines growing in the park but not really much shade. However the roads are paved, the amenities clean and modern with lots of hot water, and it is a dog-friendly park. We couldn’t really ask for more, could we? 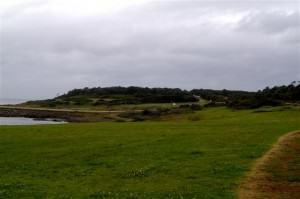 That afternoon we drove out to Bass Point, an area that is of such great archaeological significance that it’s listed on the Register of the Australian Heritage Commission. 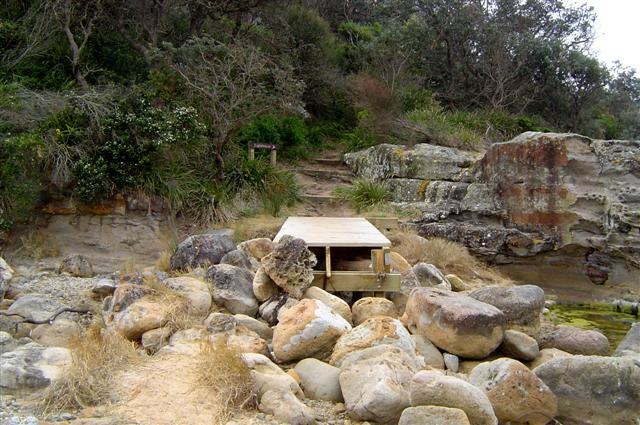 The Bass Point Reserve is a rainforest area and within the Reserve is Bushranger’s Bay, a Marine Aquatic Reserve that is very popular with scuba divers. Unfortunately, dogs are not allowed on the Reserve so John stayed with BJ while I went for a little walk to the Cities Service Boston Memorial. The Cities Service Boston, an American tanker, ran aground off this point in May 1943. In the early hours of May 16, the tanker was caught in a violent 70-knot gale and waves rising as high as the ship’s funnel lashed the 9000-ton tanker onto an offshore reef. To avoid breaking up in deep water the captain ordered “full steam ahead”, running aground on Bass Point. Members of the local Volunteer Defence Corp, Police, local fisherman, and 30 soldiers from the 6 Machine Gun Battalion AIF, mounted a rescue mission to save the 62 crewmen aboard. It was during the rescue that a huge wave swept 10 soldiers and seamen into the surging waters. 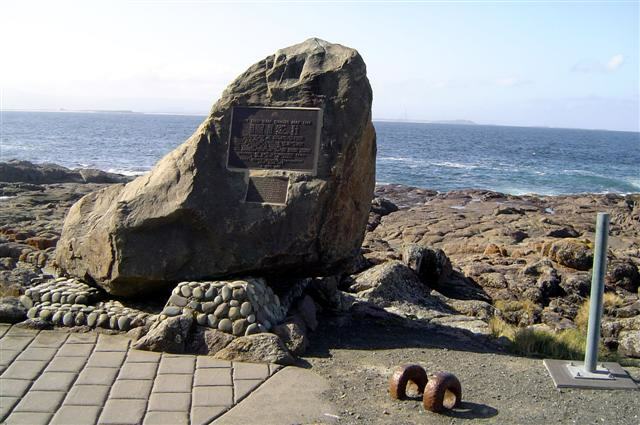 4 soldiers lost their lives and these were the only losses resulting from the shipwreck. The ship was later salvaged for scrap. On the way back we discovered a beach at the Shallows Coastal Reserve where BJ can run leash-free however the weather had turned cool and windy and with rain threatening we weren’t sure if we’d be back. 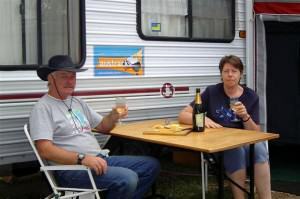 But the weather didn’t stop us from enjoying our bottle of Two Tails Sparkling Wine that evening. It was still early as we sat outside but I must admit we didn’t stay there long before we retreated inside. The next morning didn’t look like beach weather at all! Grey and overcast, the wind was cool to cold and light rain was falling. However, it did look to be clearing so we took a chance and headed south to do a little exploring in the Shoalhaven area. 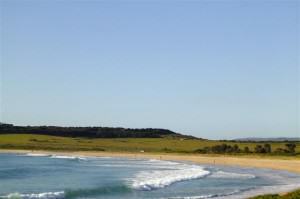 This area is blessed with one of the most beautiful landscapes on the east coast of Australia. From Berry in the north to Durras in the south the area is bounded on the east by kilometre after kilometre of exquisite beaches and stretches inland to Kangaroo Valley where there are some magnificent rainforests. In December 1797, the explorer George Bass discovered the mouth of a mighty river and because of the shoals he named it Shoals Haven. 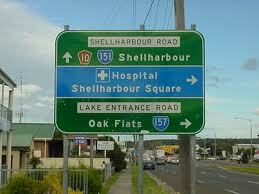 Only later when settlers started to arrive was the name changed to Shoalhaven. 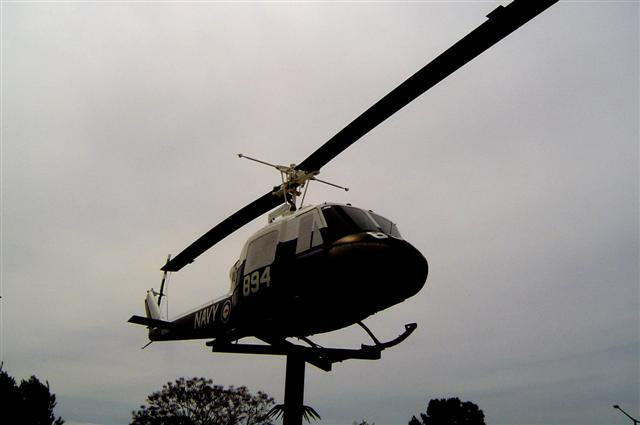 The commercial hub of the Shoalhaven is the town of Nowra where the home of Australia’s naval aviation, HMAS Albatross, can be found. 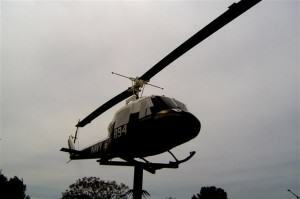 Entering Nowra, we crossed over the bridge and were greeted by the elevated naval helicopter that stands silent guard over the city. 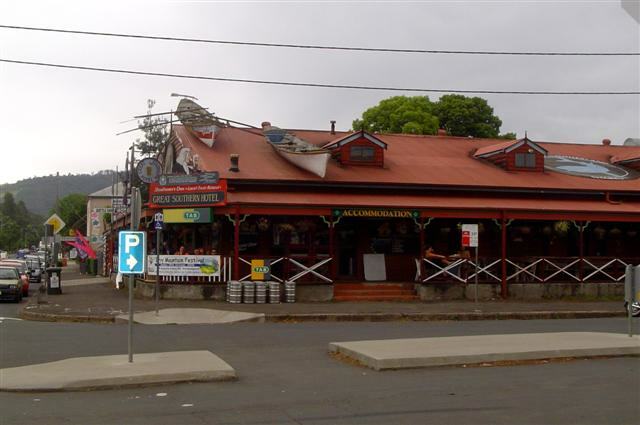 Nowra takes its name from the Aboriginal word meaning “black cockatoo” and became an established town in 1870. We didn’t linger in Nowra but drove out to Greenwell Point, one of the leading seafood ports in the Shoalhaven, some 15 kilometres (9 miles) east of Nowra. There is a small fleet of trawlers based here and they bring in their catch from offshore areas daily. From Greenwell Point we drove through the town of Culburra Beach and out to Crookhaven Heads where the mouth of the Shoalhaven River meets the Tasman Sea. 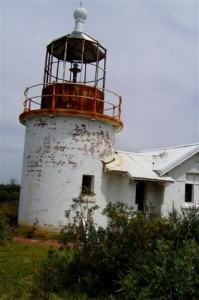 We’d heard that there is a lighthouse at Crookhaven Heads that is accessible via some scenic walking tracks. disrepair and it is obvious that it hasn’t been used in many a long year. Why it is still mentioned on some local tourist information boards is a mystery; the site should be condemned and previous visitors have used it for a rubbish dump. The thing is, with a bit of a clean up, the use of a lawn mower, and a coat of paint for the building it could be a terrific tourist attraction because the views out over the ocean are spectacular. Oh well, at least it’s dog friendly. We walked around for a while and took in the view, being careful to avoid the piles of rubbish, before we made our way back down the track feeling a little disenchanted with the local Parks and Wildlife people. This area is their responsibility, after all. It had been our intention to have lunch at Crookhaven but we decided to move along to Orient Point instead. The sky was still overcast and I think the greyness matched our mood right about then. We stopped at a reserve near the boat ramp for lunch. Orient Point is a quiet little village across the river from Greenwell Point. A few fellows were out in boats but in spite of all the gear they had I don’t think they were catching very much. There were several boats moored but not a lot of activity. As I said, a quiet little village. Our next stop was at the town of Callala Bay at the northern end of Jervis Bay and within reach of the Jervis Bay Marine Park. This small town is very well known for its safe bay swimming and dolphin parades and is a very popular marina. Jervis Bay itself is extremely popular for its natural attractions. Now classified as a Marine Park the bay is host to an abundant range of wildlife, including seals, sea eagles, penguins, and of course, dolphins. But by far the star attraction is the humpback whales. The bay is a regular haunt for the humpbacks as they make their way to and from the warm tropical waters of the north during June and July and again from September to November each year. They become quite acrobatic here in the bay and I think it would be something to see! Leaving Callala Bay, it was time to start heading back to Shellharbour but we had a couple more stops along the way. 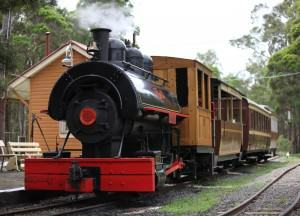 The first was in the town of Berry, approximately 20 kilometres (12 miles) north of Nowra. Berry, the “Town of Trees” is very much a country town and is endowed with an awful lot of country charm. As a magnet for city folk wanting to experience the country life, Berry is irresistible. Known for its antique shops, its stunning gardens, and its wineries, it also boasts a number of historical sites, fully restored buildings bearing testimony to early history, and a museum. After our brief stop in Berry we continued north along the highway before making a detour for a stop in Kiama, home of the famous Blowhole. 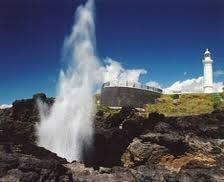 Sydney and is perhaps best known for its famous natural attraction, the Kiama Blowhole. Discovered by explorer George Bass in 1797, the blowhole spurts seawater up to 60 metres (197 feet) into the air when the seas and wind is prevailing from the south-east. In Kiama itself there are many restored heritage buildings, including the pink Post Office. There is also a Pilot’s Cottage near the Blowhole. It was built in 1880 for the officer in charge of the port and his family and is now a museum. One of Australia’s best known poets, Henry Kendall, was struck by the beauty of Kiama and his poem “Kiama” was written in 1862. We stayed for a short while but the wind had picked up and was quite cool so we decided to go on back to camp but John can never resist the chance to drive down by the fishing boats at the marina. Most of the boats were in and moored for the night, only a few diehards would be out now. And so we drove on back to Shellharbour and our camp. The wind had died down somewhat and it had become a little humid by the time we got there. Little did we realise that it was the calm before the storm and we were in for a wild old night. Just after 8:00 a southerly change came through with unbelievably strong winds and heavy rain. We almost lost our awning from the side of the van and if it hadn’t been for a few of our camping neighbours I think we would have. I felt sorry for the folks who were in tents and having been there and done that we knew exactly what sort of night they were having! Dawn heralded the start of a cold and miserable day. The wind abated a smidgeon about mid-morning but this was definitely winter weather. However, it wasn’t raining and so we set off for Bass Point and South Beach where BJ could run leash-free for a while. The wind was cold and icy but that didn’t stop BJ from enjoying himself. Why do little dogs have to roll in the sand? One thing was for sure, he wasn’t going to get his feet wet. I’ve never known a dog to be so scared of the surf! A few surfers were out braving the waves but there wasn’t much swell and they spent most of the time just sitting on their boards. We left the beach and drove around to the marina and Shellharbour foreshore. The weather looked like it might start to clear and as this was our last day we were hoping for a little bit of sunshine. The marina and foreshore is a terrific place for a picnic, a swim in the salt-water swimming pool, or even lunch on the Ocean Beach Hotel balcony overlooking the water. There is a pathway that runs along the foreshore and into the children’s playground and we set off with BJ for a stroll along the promenade. It wasn’t until we reached the park that we noticed the “no dogs allowed” sign. Understandable as not all dogs have a pleasant disposition. There are a number of museums in and around Shellharbour that are really worth a visit, including the Tongarra Museum with its displays of Aboriginal and European culture, the Light Railway Museum with its diesel and steam trains, and HARS Aviation Museum with its fully restored operational aircraft. After much deliberation I opted for the trains and we set off early in the afternoon. We wandered around for a while but it was cold and windy outside and we decided to return to camp. would have been too cold for swimming although that doesn’t seem to bother the diehards. And so our short break in Shellharbour had come to an end. In spite of the weather we’d thoroughly enjoyed ourselves and have made a promise to return some time when the weather is a little better. 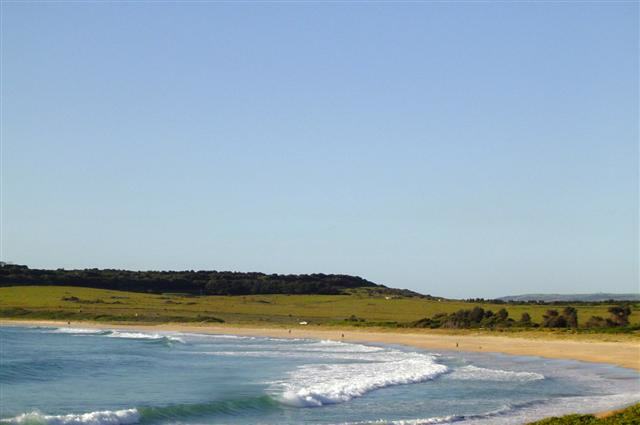 The close proximity to Sydney is only one of hundreds of reasons why Shellharbour is great place for a weekend, a few days, or a longer stay. Generally the weather is good at any time of the year and you can relax and soak up the sun, take a leisurely stroll along the sand, or even watch the sunrise over the Pacific Ocean. Whatever takes your fancy, you can’t go far wrong at Shellharbour.